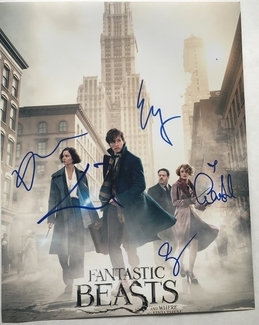 We never sell copies or reproductions of any kind; this photo has been hand-signed by Eddie Redmayne, Katherine Waterston, Alison Sudol, Dan Fogler & Ezra Miller. Eddie & Ezra signed this photo at the Apple Store in New York City on November 9, 2016. Katherine, Alison & Dan autographed this picture at The Today Show in New York City on November 4, 2016.